We are committed to delivering the very best in eye care. Our team of doctors, technicians, opticians and support staff will work to treat our patients with dignity and respect; provide dependable and courteous service; communicate clearly and honestly; protect patient confidentiality; and earn our patient’s trust. We are the leading ophthalmology practice in Berkshire County offering complete one-stop eye care. Our office provides comprehensive eye care, from newborn evaluations to treatment of age related conditions such as macular degeneration. We offer routine eye exams and also specialize in the latest laser procedures. We perform "no stitch" cataract surgery using topical anesthesia; "no needle" and "no eye patch" in our state of the art Ambulatory Surgical Center. Our practice is unique in Berkshire County because we have cornea, glaucoma & retinal specialists on-site. We offer glaucoma evaluations and have a regularly scheduled retinal clinic staffed by fellowship-trained sub-specialists. Berkshire Eye Center prides itself on providing the highest quality of medical care for our patients. 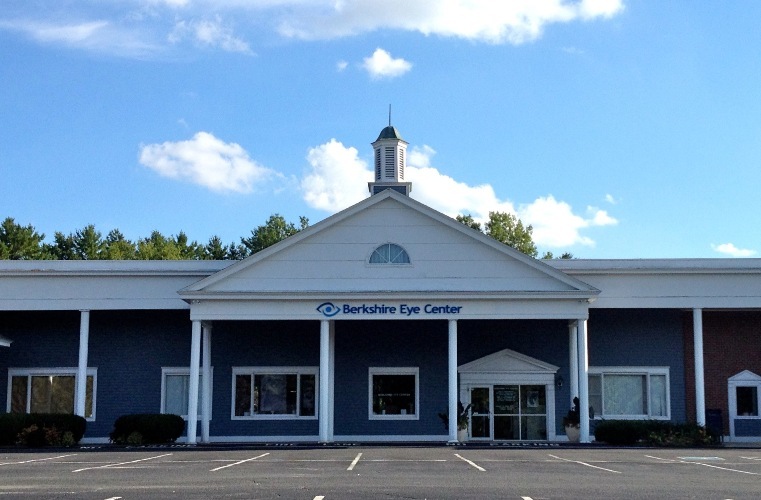 Berkshire Eye Center officially opened its doors in June of 1995 at the Williams Street Plaza in Pittsfield, MA. The center was established in a vacant space that was once a supermarket. The larger space allowed our physicians to expand their professional services in comprehensive eye care for the community. Berkshire Eye Center (BEC) has been an anchor for the Plaza. The once sleepy Williams Street Plaza has seen a re-awakening. In addition to several retail and office spaces, with BEC as its front leader, the plaza has attracted several other health care practices including physical therapy, podiatry and gynecology. Berkshire Eye Center’s origins were two smaller practices once located on South Street in Pittsfield. The first practice was owned by Dr. John Galt, Dr. Gregory Shouldice and Dr. Fred Orlando. The second practice was known as Berkshire Eye Associates and was run by Dr. Bruce Evenchik and Dr. Michael Cancilla. Berkshire Eye Center is result of the vision of Dr. John Galt. He was the leading physician who expressed the most interest in merging the two friendly competitors in Ophthalmology. When the eye MD’s were in the beginning stages of possibilities, they met on several occasions to determine if merging would be in the best interest of the two practices and their patients. After collaborating, they all discovered that each of them brought a little something different to the field and their professional respect and admiration only grew from there. Dr. Galt saw that during their encounters as a group, the potential for even greater success was not far from sight; he was right. In this case, merging the two offices proved to be very beneficial to both the staff and patients. In 1999, Dr. John Galt retired after a long and productive career in Berkshire County. Although he no longer practices, many of his ideas live in the trainings, practice philosophies and office design aspects he once contributed. In 2001, Berkshire Eye Center said goodbye to another one of its senior physicians, Dr. Michael Cancilla. Dr. Cancilla also retired after a long stint as a general Ophthalmologist. Our staff and the physicians’ many loyal patients are immensely grateful for outstanding quality care Dr. Galt and Dr. Cancilla provided. Their dedication, professionalism and unique blend of good humor continue to be missed. Throughout the years, BEC has become a model for efficiency and state of the art comprehensive eye care. In 2005, we welcomed Ophthalmologist Dr. Neal Ginsberg, MD to our practice. Dr. Ginsberg specializes in corneal transplantation and laser vision correction. Before joining us, Dr. Ginsberg was appointed to the teaching staff at the Boston Veterans Hospital as well as Boston University Medical Center and spent time supervising and training residents from Boston University and the Massachusetts Eye & Ear Infirmary in modern cataract surgery. Two years later, we are proud to say that the attending physicians and Board members, appointed Dr. Neal Ginsberg as a fourth business partner in the practice. Dr. Ginsberg has been one of the driving forces in providing our patients with the best quality care and allowing for our facility to offer advanced technology in today’s modern medicine. Presently, Dr. Bruce Evenchik, Dr. Gregory Shouldice, Dr. Fred Orlando and Dr. Neal Ginsberg are our Board of Directors and co-partners of the practice. New additions, afforded by the growing size of Berkshire Eye Center have also included the rotation of two sub-specialists and two Optometrists. Retina and glaucoma services, once requiring out of town travel, are now conveniently offered in our home office. Dr. Paul Fellenbaum, our glaucoma specialist (whose primary office is based out of Albany, NY) and Dr. David Agahigian, our retinal specialist (whose based out of Springfield, MA), are both available to consult with our patients on a regular basis in our Pittsfield office. In addition, Dr. William Goodrich, one of our Optometrists, joined us back in 1999 and has been with us ever since. Dr. Goodrich merged his practice in Valatie, NY with our other 2 locations in Massachusetts to allow us to service our patients in New York State as well. Dr. Goodrich continues to practice in all 3 of our office locations and specializes in contact fittings and prescriptions as well as annual routine eye care. We are very fortunate to have such great physicians, staff and professionals that provide quality care and services to our patients in Berkshire and Columbia County. Berkshire Eye Center is one of the leading ophthalmology practices in Berkshire County. Although the Pittsfield location remains our main office, medical and optical services of Berkshire Eye are available in all 3 locations. Our Valatie, NY office in Columbia County continues to offer appointments for general eye care on a regular basis as well as services for eyewear and sun wear in our optical vision center. Patients in the south county area are utilizing our Great Barrington (GB) office as well. The GB office is located in the Price chopper/K-mart Plaza and offers a full service optical vision center as well as a regular rotation of the BEC doctors for patient appointments. All three locations offer a large variety of frames, traditional and designer primary eyewear and sun wear as well as safety and sport eyewear. We fit all types of contact lenses and satisfaction is 100% guaranteed. In addition, patients are able to see one of our doctors on a routine basis in any of our three locations. Our goal is to continue to stay ahead of the curve of the ever-evolving world of health care. We are dedicated to providing the highest quality eye care in the region. This not only requires a continual investment in the latest technology, but also demands a much more human investment. We will strive to maintain the most competent and well-trained team of staff and physicians possible and we will continue to focus on our number one priority; the well-being and respect for our most important element: our patients. We thank you for supporting us through the years and look forward to serving you in the exciting times to come.